A wildlife paradise situated on 12 acres in P/W school district. 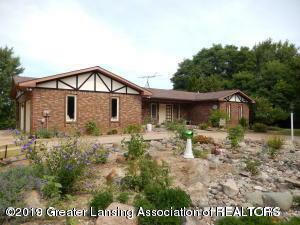 This 1,416 sf brick ranch has stunning views of the rolling property from the upper level deck or the walk-out basement. The upper level has 2 bedrooms and 1 bathroom. The lower level has a full kitchen with a bedroom and bathroom. Check it out today at a reduced price. Directions: I96 to Grange Rd north to Chadwick turn left and home is on the right.